Mistake #1: You're not shampooing enough. The "no 'poo" method is still trending like crazy, but it might be why your strands are getting stringy. "If you don't shampoo at all, it can get greasier," explains Sejal Shah, M.D., a New York-based dermatologic surgeon and RealSelf contributor. 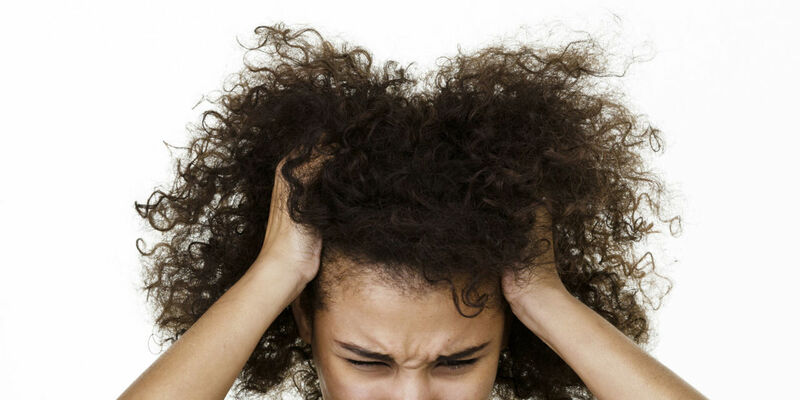 "This happens because oil, dead skin cells and debris builds up on the scalp, weighing down the hair." Mistake #2: You're shampooing too frequently. On the other hand, lathering your hair too frequently could also be to blame. "If you are washing too much, the scalp skin is constantly being stripped of oils," says Dr. Shah. "Just like skin in other areas, it will respond by producing more oil to replenish the lost oil." The result: Greasy hair that just never seems to get clean, no matter how hard you try. Jeffrey J. Miller, M.D., assistant professor of dermatology at Pennsylvania State University College of Medicine, also advises taking your environment into consideration. For example, if you live in a rural area with clean air and low humidity, it's OK to shampoo every few days. But if you're in a city or if you workout frequently, you should cleanse your hair and scalp each day. Mistake #3: Your conditioner is being applied incorrectly. Your hair needs conditioning to keep it moisturized and healthy, but the phrase "too much of a good thing" definitely applies here. "Using conditioners on your scalp can add to the grease if you already have an oily scalp, as they contain emollient ingredients," warns Kristine Cruz, a hairstylist and makeup artist at Antonio Prieto Salon in New York. She recommends cleansing the hair with shampoo, rinsing and then applying the conditioner mid-shaft through the ends. Mistake #4: The water you're rinsing with is too hot. Sorry, hot shower fans. "Scalp skin can become dry with overexposure to hot water, resulting in dry skin and overproduction of oil to compensate," says Dr. Shah. Rather than pumping up the heat during your shower, stick with a medium-warm temp. In fact, Cruz recommends running cold water through your hair at the end for shine, as it closes the cuticles. Bonus: Less heat during your shower time is actually better for your skin. Mistake #5: The styling products you're using are too heavy. Products like waxes, creams and oils can make your hair greasier too, since they're made with emollients like natural oils, says Cruz. Look for lightweight products and pay close attention to how they make your hair feel — if it's too slick or slippery, steer clear. Mistake #6: You straighten your hair every day. Bad news for flat iron lovers: Your straightening habit might be making your hair look oilier than you'd like. "If you straighten your hair, it will lie closer to the scalp, coming into contact with more oil and appearing greasier," explains Dr. Shah. Mistake #7: The curling wand, flat iron and brushes you use are dirty. Just like dirty makeup brushes can make you breakout, using dirty hairstyling tools has repercussions for your scalp. "If your styling tools are dirty, you can transfer oils and dirt to the hair," says. Dr. Shah. Check the directions on your heat tools and brushes for how best to clean them. Mistake #8: You're brushing your hair too frequently. A big styling myth is that brushing your hair 100 strokes per day keeps it healthy and gorgeous. In reality, it can actually make it look greasier. "Over-brushing can stimulate more oil production," explains Dr. Shah. Your best bet: Detangle your hair from the bottom upwards and style it as needed. Mistake #9: You're relying too much on dry shampoo. I'm as big a fan of this stuff as anyone, but that doesn't mean it's healthy to use it for five days straight. "You can use dry shampoo, but make sure that you are regularly washing so that it doesn't build up on the scalp," advises Dr. Shah. Plus, nobody wants that powdery, dull look that comes from spritzing on too many layers of dry shampoo!